Combine two of the best 5-star properties in Ireland for a taste of luxury, while playing five of Ireland’s world class golf courses. In the Irish countryside Lough Erne Resort is a true ”Lord of the Manor” luxury experience in every way. 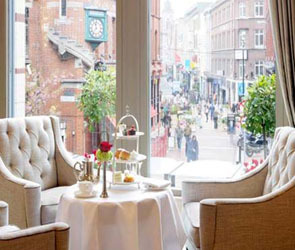 While The Westbury Hotel is the perfect address in Dublin, only steps away from Grafton Street and Trinity College. Take time to explore Ireland’s northwest landscape including Sligo/W.B. Yeats country, the wild hills and coastline of Donegal, and the rejuvenated and very popular city of Belfast. Enjoy great shopping, sightseeing, traditional pubs, fine restaurants and cultural attractions. This itinerary also makes for a perfect non-golfer leisure break! Arrive Dublin Airport, pick up your vehicle, and get settled in for a three night stay at the beautiful Lough Erne Resort, named 2010 Golf Resort of the Year by the Irish Golf Industry. With time and energy, you may wish to play a round on one of the estate’s two championship courses. Designed by Harry Colt in 1927, Rosses Point still has all the dignity and maturity of age. 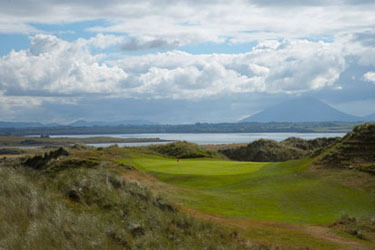 The Benbulben Mountain competes with the Atlantic Ocean for scenic splendor, as you factor the breeze from the sea into your game. The 3rd, 5th, 10th and 14th holes have very satisfying downhill drives to compensate for the stiff breeze. Beautiful Enniscrone offers panoramic views of Killala Bay, sandy beaches, and the Nephin and Ox mountains. Founded in 1918, and redesigned by Eddie Hackett in 1974 and Donald Steel in 2001, this Irish championship course is one of Ireland’s finest links. Golfweek magazine ranked this Faldo Championship Golf Course among the top 10 in “Best of Great Britain and Ireland Modern Classic Golf Courses, 2011.” Fourteen of the holes have water in play, and a highlight is the iconic 10th hole, “Emerald Isle,” where the green is surrounded on three sides by water. In Dublin, settle in at the wonderful The Westbury Hotel. The hotel has an unbeatable location just off of Dublin’s Grafton Street which puts you within easy reach of great shopping, pubs, restaurants, galleries, and attractions such as Trinity College and Temple Bar. Names like Nicklaus and Trevino, Ballesteros and Langer, Faldo and Floyd, Norman and Els … and none more legendary than Ireland’s own Christy O’Connor have tested their games against the best on this respected championship links. Today is the day for you to join their ranks! Founded in 1894, Portmarnock is consistently ranked among the top golf courses in the world. With a rich history closely aligned to the progression of golf in Ireland, Portmarnock has hosted many professional and amateur events, including multiple Irish Open Championships and the Walker Cup. Transfer to Dublin Airport for your return flight home or continue your vacation!